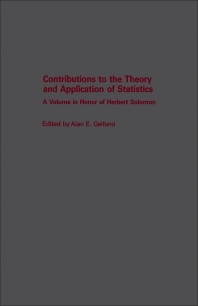 Contributions to the Theory and Application of Statistics: A Volume in Honor of Herbert Solomon is a collection of 20 papers that cover the significant contributions of Herbert Solomon in the field of statistics. This text is organized into four sections encompassing 20 chapters. Each section defines an area in which Herb has made a contribution and the papers are ordered alphabetically. The first section consists of four papers in the area of operations research and applied probability, while the second section gathers six papers looking into problems in distribution theory and geometric probability. The third section contains five applied articles in the areas of law and justice, medicine, and psychology. The fourth section covers five papers that explore several inference issues. This book will be of value to statisticians and advance students.